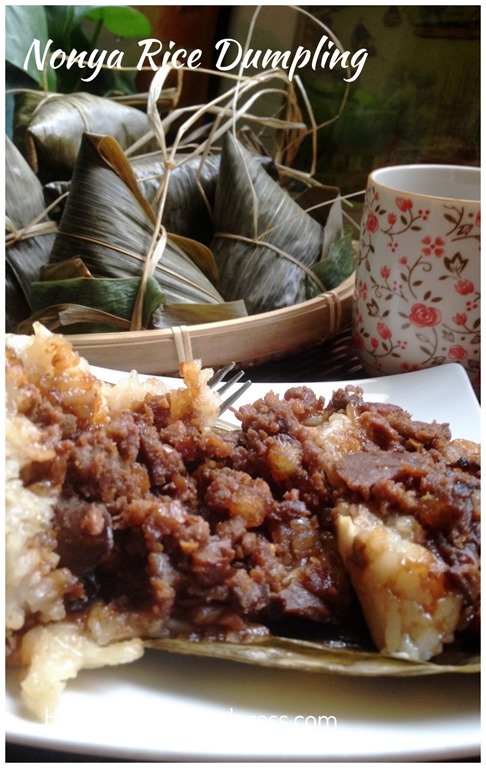 Dragon Boat activities are basically carried out during the Chinese Rice Dumpling Festivals (Duan Wu Jie (端午节）in Mandarin）and during these festival, rice dumpling were prepared for offering to the famous ancient Chinese Poet, Qu Yuan (屈原). 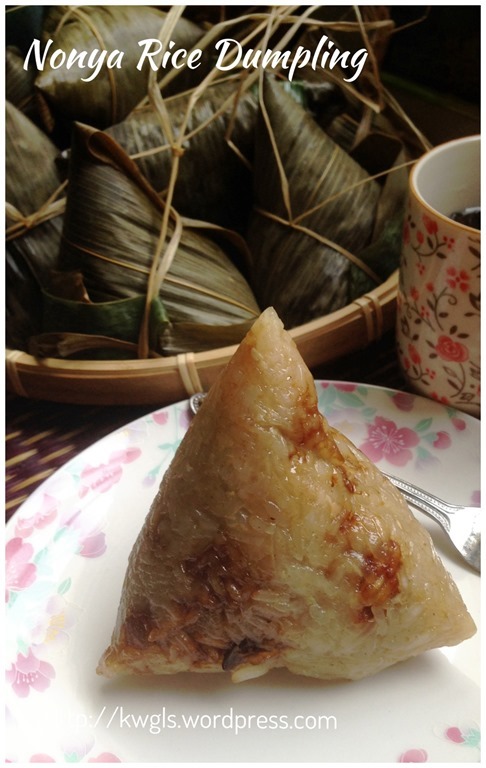 Though the origin of rice dumpling is from China, however, overseas Chinese have incorporated each countries local elements into their version of rice dumpling. A peranakan lady is also called a nonya and their cooking blends both Chinese traditional and localized Malay elements. 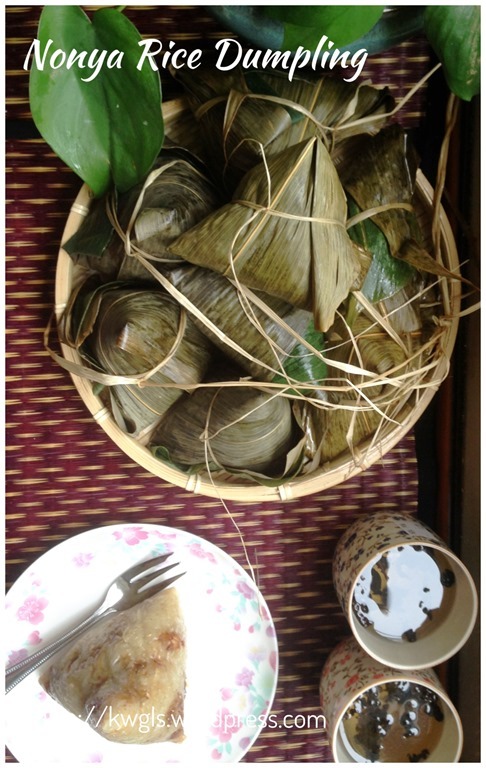 This post will detailed the process of preparing the Nonya version Chinese Rice Dumpling (hereinafter refer to as “Chang” or “Nonya Chang”). 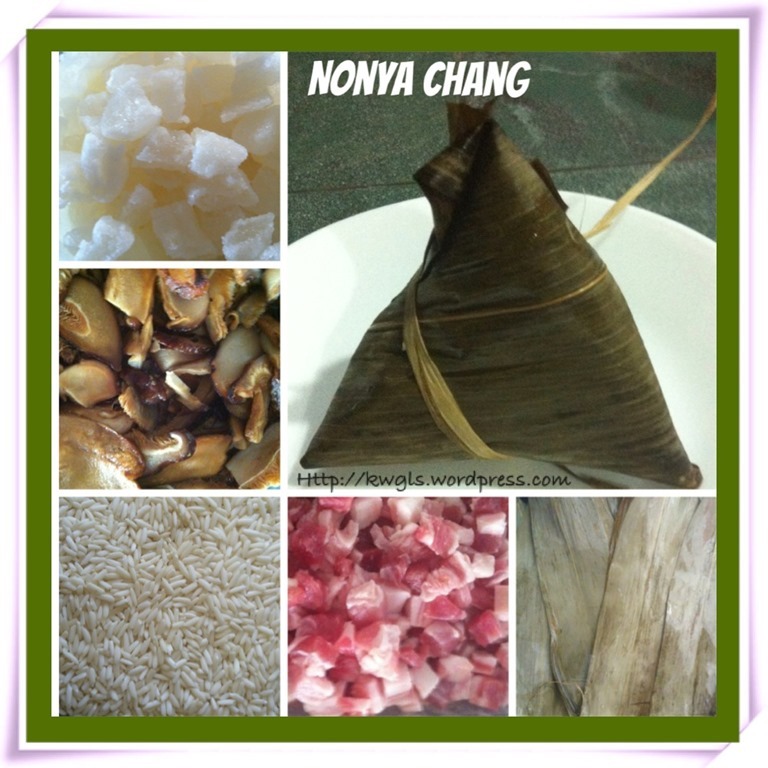 This is Part II of the Nonya Chang series and will provide a simplified method of preparing the Chang. Part I of the series talk about the history of Chang and Nonya Chang, the reasons why less and less Chang prepared at home and the reasons why Chang command such a high premium. You can read it HERE. 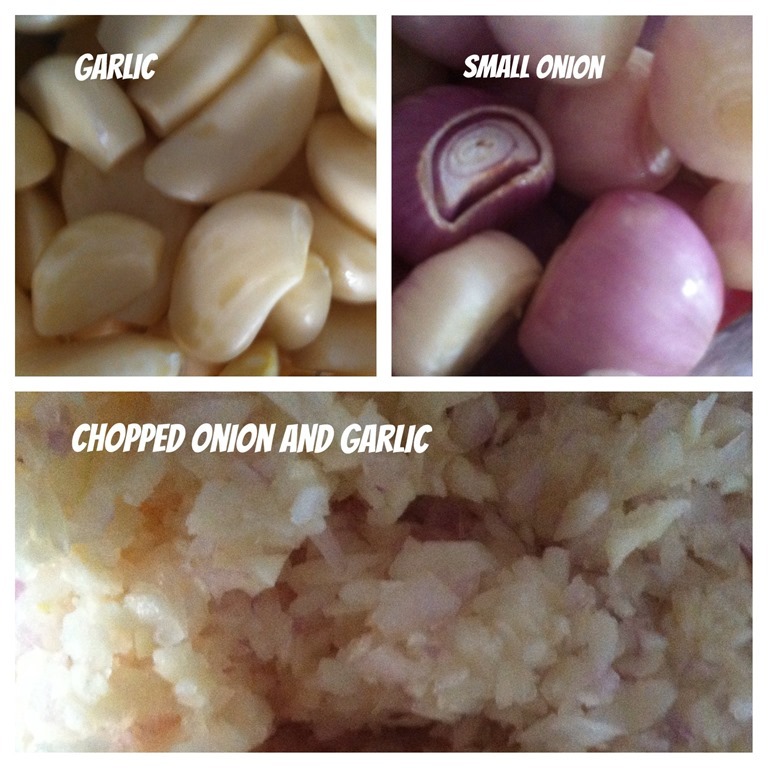 The recipe below is a rather simple recipe that both my wife and myself likes. I have been using this recipe for more than 5 years. Both my wife and myself do not like other ingredients in the commercial Chang like chestnuts, dried shrimps etc.. and in our first attempt, we agreed that we shall only have 3 main ingredients, pork, mushrooms and candied winter melons and we have been using the same ingredients since then. 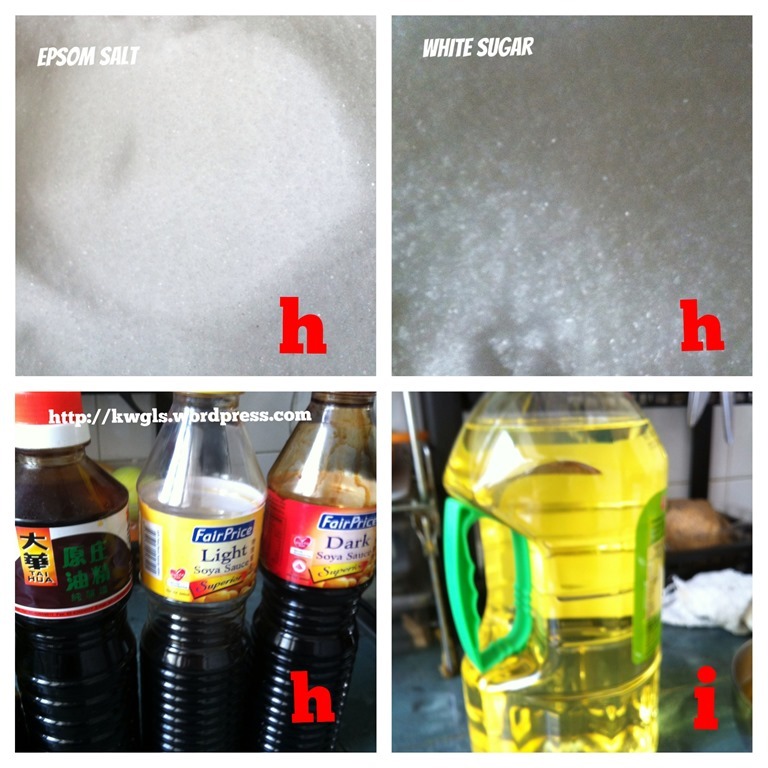 Therefore, this is a very good starting basic recipe for Nonya Chang. The table below summarizes the ingredients required for making about 30 Chang from 1.2 kg of rice or about 40g of uncooked rice per Chang. Column one shows the ingredients or material required. Second column shows the measurement in box. I have purposely used the box as a measurement unit as it is easier for me to measure and can keep my material systematically. I have also included the weight equivalent that I measured during the process for your reference. But my recommendation is to USE THE BOX MEASUREMENT AS IT IS QUITE ACCURATE. 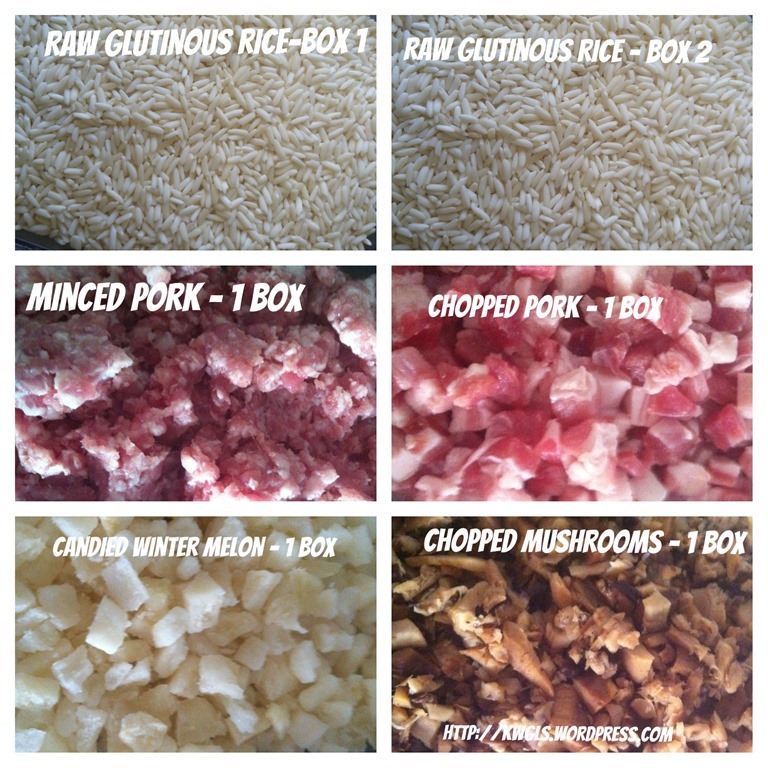 Traditionally, the pork were being boiled in the water and after cooked, it was manually diced into about o.5 cm cube. 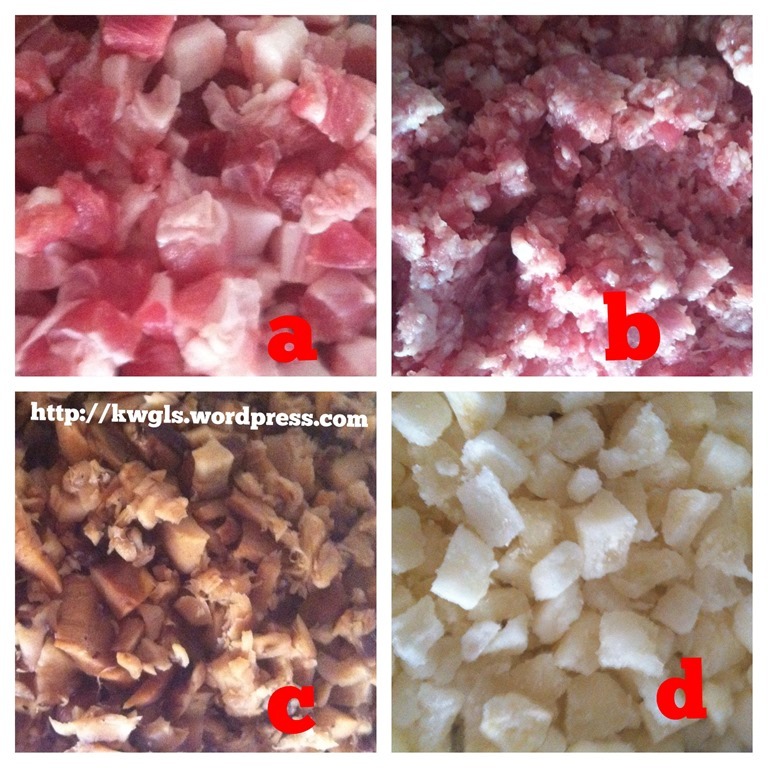 However, in order to save time, I have used a mixture of minced pork and diced pork that were sold in the market. Instead of dicing the mushrooms into cubes, I have buy the cut mushrooms, soaked it and use a blender to process the mushrooms into small biteable chunks. I know older generations are very particular about the dicing of mushrooms into cubes but for me it is acceptable because all the ingredients will be cut into very small pieces. This will also be diced into small cubes of 0,5 cm. Usually, the size of meat, mushrooms and winter melons are of the same size. These I have manual diced it instead of using food processor because if winter melons are too small, when cooked, you will not be able to “find “ it when you bite the fillings. 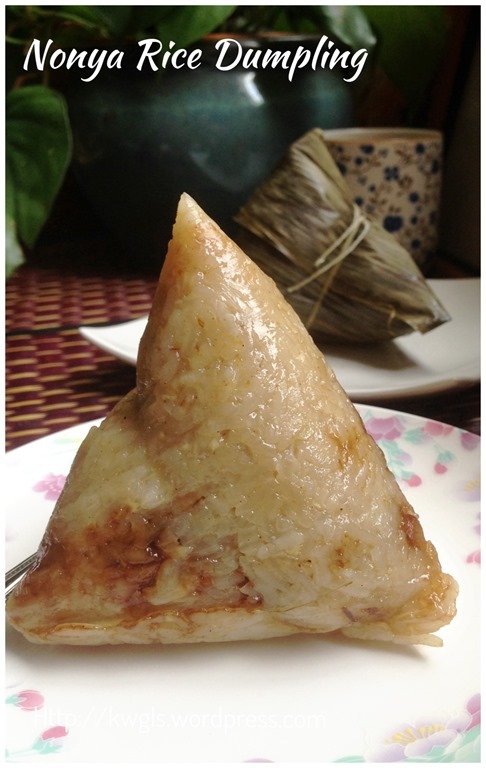 Meat to uncooked glutinous rice ratio should be 1:1. This may sound a bit unbelievable because rice will expand when cooked whereas meat will shrink in volume when cooked. The shrunk volume will be made good by volume of mushrooms and winter melons. Coriander powder IS A MUST in Nonya Chang. It is this ingredients that make Nonya Chang its unique flavour. These two items are rather optional. 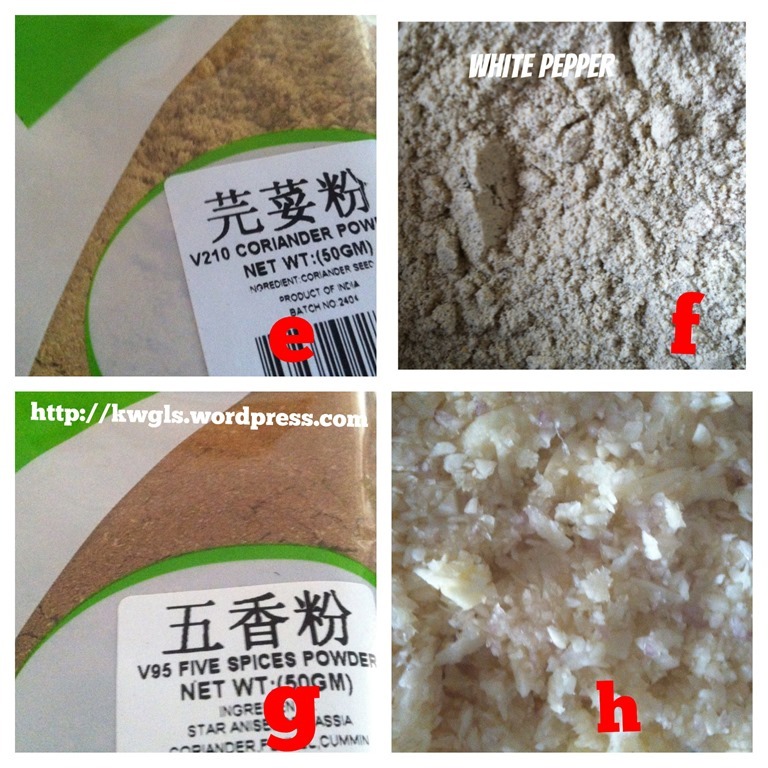 It is traditional that we put the white pepper powders but for five spice powders, just a bit (to your taste) will do. Five spice powders is the usually used in the other Bak Chang, it should not be too much until it over “shadows” the aroma of coriander powder. This again is optional but for my recipe, we used lots of chopped garlics and onions. It is my personal opinion that both the rice and fillings should have the fragrance of garlics and shallots. Just chopped it using a food processor. Most recipes in the net will give you minimal seasonings and all these seasonings are OPTIONAL and should be adjusted accordingly to suit your families palates. One thing that I have to highlight is that seasonings are important to ensure your rice and fillings are tasty. In additions, if you are boiling the Chang instead of steaming the Chang, even more seasonings are needed as the water will dilute your rice and fillings. You will not want to prepare something that is tasteless and only you know exactly the taste for your family. These oils will be needed to fry the rice and the fillings. You can adjust the oil quantity accordingly. 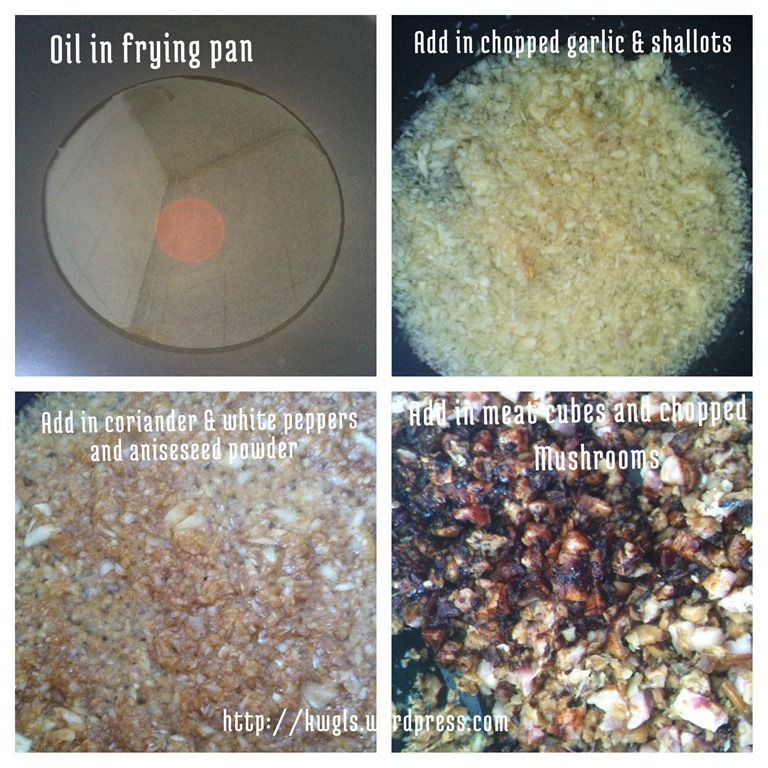 Depending on the type of meat you are using, if it is pork belly, after you fried for a while, fats will be converted to oil and you only need oil just enough to fried the garlics and shallots. Any excess oil can be drained off before you wrap the Chang. You can either use the fresh bamboo leaves or the dried bamboo leaves. However, it is difficult to get big size bamboo leaves nowadays. 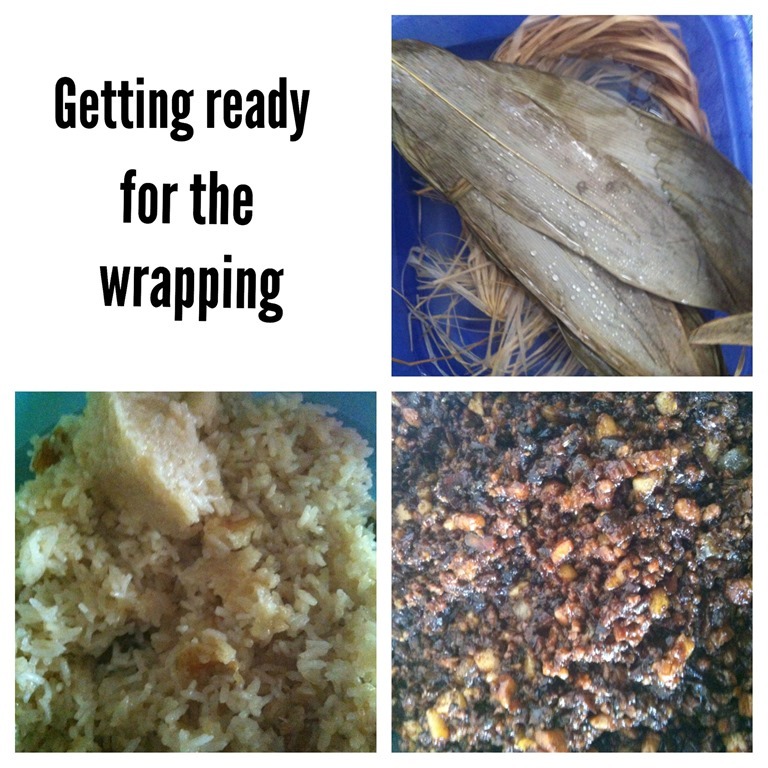 You will need to prepare at least 2 times the number of Chang to be wrapped plus another 10% for spoilages. E.g, using my recipe above, since I am making 40 Chang, I will need 40 x 2 = 80 leaves plus another 20 leaves set aside for reserve use. You have to clean and soak the dry leaves in water for at least about 1 hours or until you feel the leaves are soft and easy to be twisted in any shape. If you want it to be faster, you can used hot water. Alternatively, just soak it overnight. 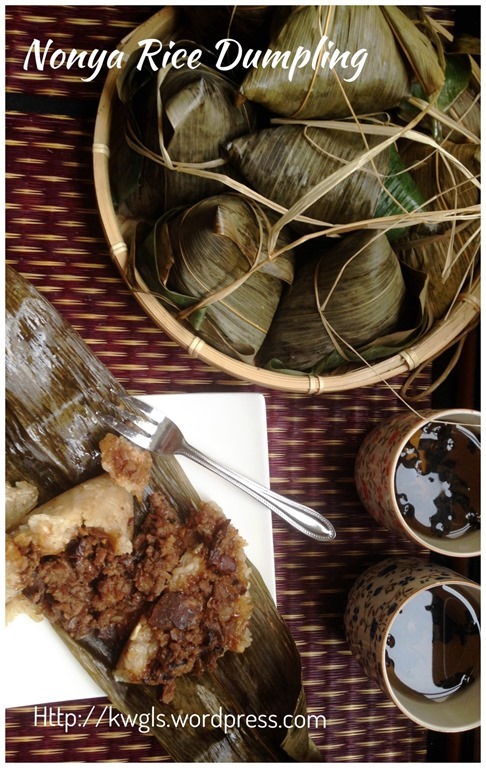 Traditionally, Nonya Chang uses the big Pandanus leaves for the wrapping and it is one of the things that differentiate it with other Chang. 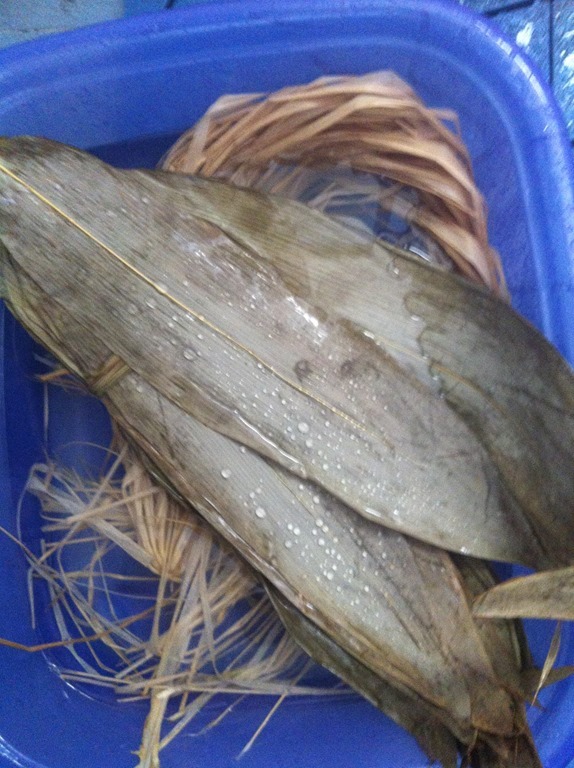 Even in Kuching, Sarawak, people still uses these Pandanus leaves. However, in Singapore, it is very hard to get hold of these leaves and one leaf will cost you about SGD1 which can be cut into 3 pieces for the wrapping. It is hard to find the images for big Pandanus leaves. I have managed to get hold of some pictures from www.sgkopi.com to share with readers. 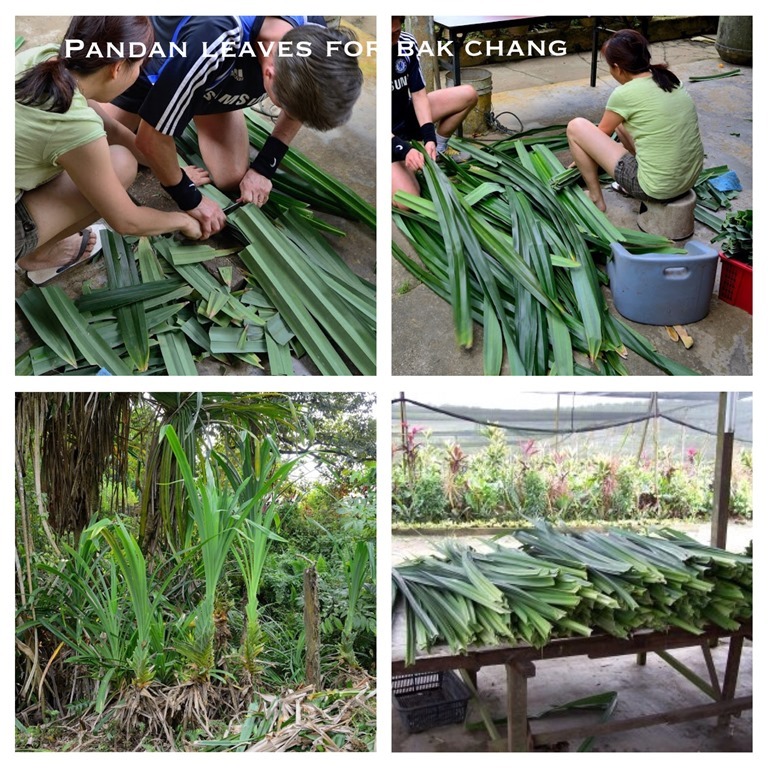 If we are using Pandanus leaves to wrap the Chang, more works are required. Firstly, you have to cut the leaves into the sizes that you like. It will be followed by dethroning the leaves and you have to peel off certain veins such that the leaves are softer. It will then be washed and “blanched” in the hot water to soften the leaves. So, in order to save time, the big bamboo leaves imported from China is still preferred. Since I managed to get hold of the reed strings or straw strings, I preferred to use them. The reasons no other than preserving the traditions. If you can’t, just use cotton strings (as used in the cross stitch or knitting of table cloths or dish cloths) or nylon strings. If you are a newbie , I would advise to USE THE COTTON STRINGS as it is the easiest to tie and reed string will break. 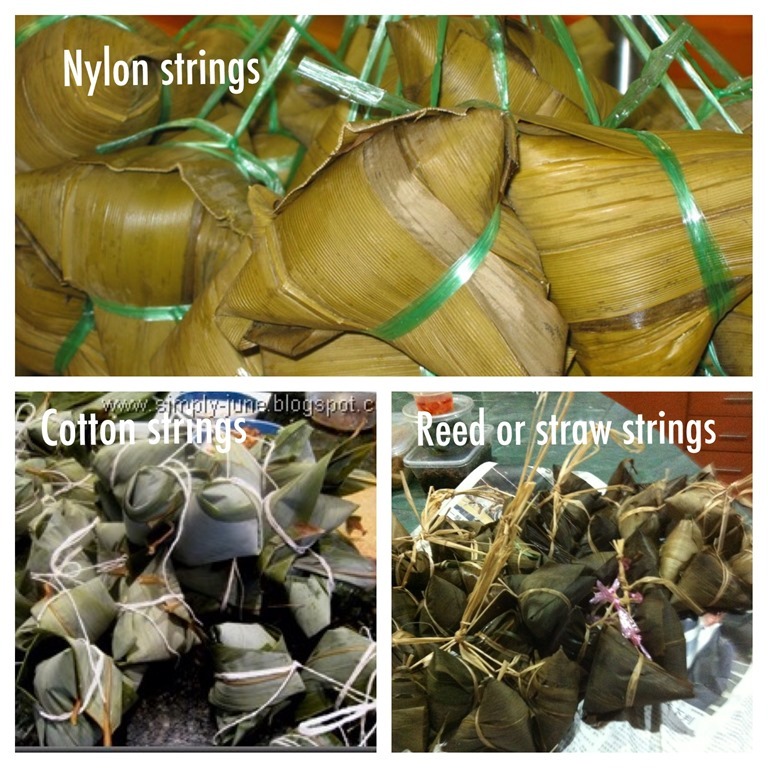 as for the nylon strings, you have to make it thinner and it is not advisable to boil under high heat. 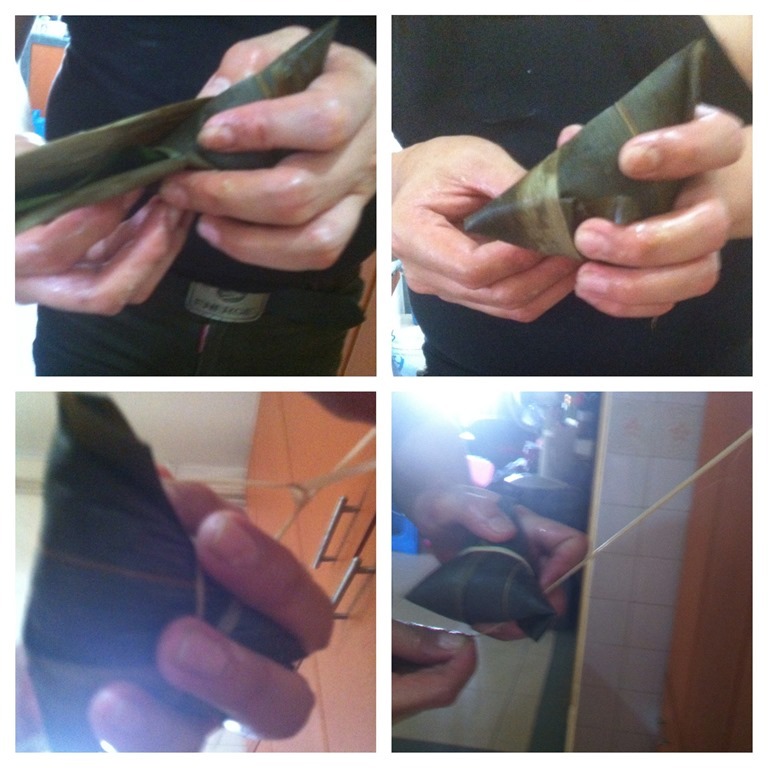 Note that the 1st picture is using Pandanus leaf plus a bamboo leaf and uses nylon strings; the string used in the second picture is using a cotton string and the 3rd picture is my Chang wrapped using Bamboo Leaves and reed strings. As it is hard to get the big Pandanus leaves, I have used some small Pandanus leaves which was cut into small pieces for uses in the cooking of rice and can be recycled by wrapping inside the Chang. The butterfly pea flower shall be used for the colouring and it is optional. As far as I know, besides colouring the rice into blue or indigo, the flower do not have any other purposes in the cooking. 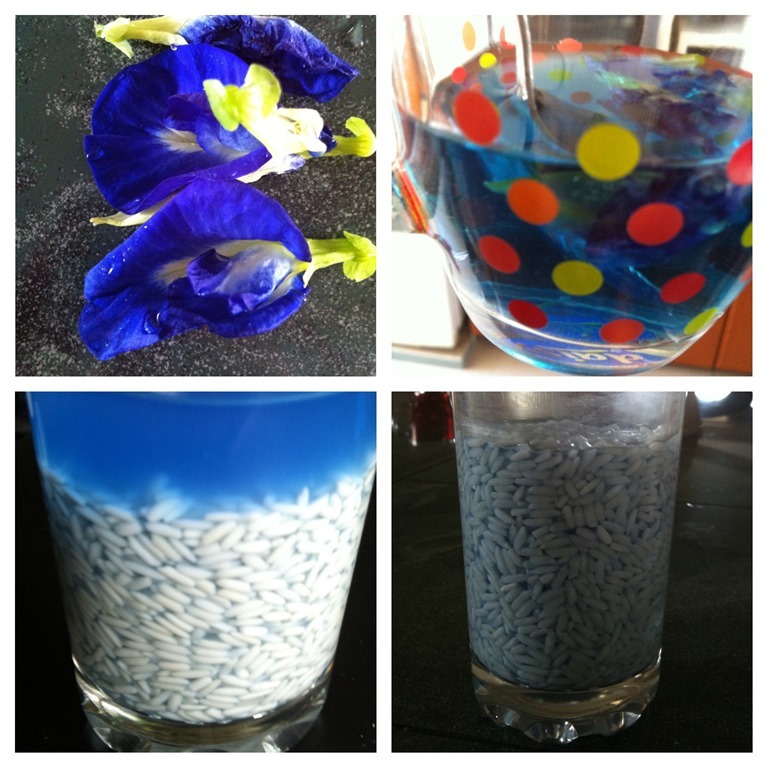 If you plan to use this, soaked the flowers in hot water for 1-2 hours, let the colour diffuse into the water and use these water to soak the rice before cooking. In my demonstration, I did not use these flowers. These are the pea flowers that I just pluck this morning and after submerging into the water for an hour, the colour of the water become bluish. After one hour of soaking the rice, the rice is slightly bluish. As I have only used 4 flowers for demonstration purposes, therefore the colour is slightly lighter. If you insist to have blue colour but do not have any pea flowers, then, use blue colouring. Clean the leaves using a new sponge and wipe the leaves. Soak the leaves in hour for 1-2 hours. Use hot water if you want the leaves to be soften faster. If you looked at the recipes in the net, they are likely to advise you to soak the uncooked rice over night or at least a few hours. However, as this is the short cut method, I have steamed the Chang instead of the boiling the Chang. I will cooked the rice and therefore no soaking of uncooked rice is required. 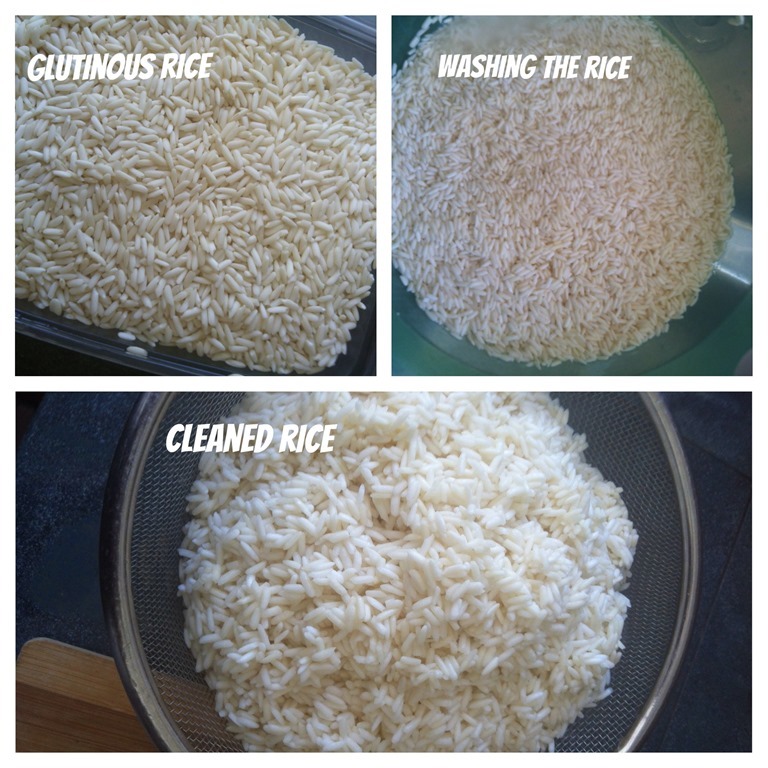 Wash your rice with clean water and sieved it when done. If you want to use the pea flower, you will have to soak the rice in advance the let the blue colour penetrate into the rice. Add in half of the coriander powder, white pepper and five spice powder to the mixture and continue frying until the garlics and shallots start to turn brownish. This is pretty fast and you have to carefully monitor it, otherwise, it will get burnt. Add in the glutinous rice and fried until well mixed (not cooked and it should be quite fast). Add in seasonings and take a few uncooked rice to taste. I have to remind again that you should be rather heavy handed with your seasonings, otherwise, the rice will be tasteless. Add water (about 1 cup of uncooked rice with 1 cup of water). Stir it to mix well. 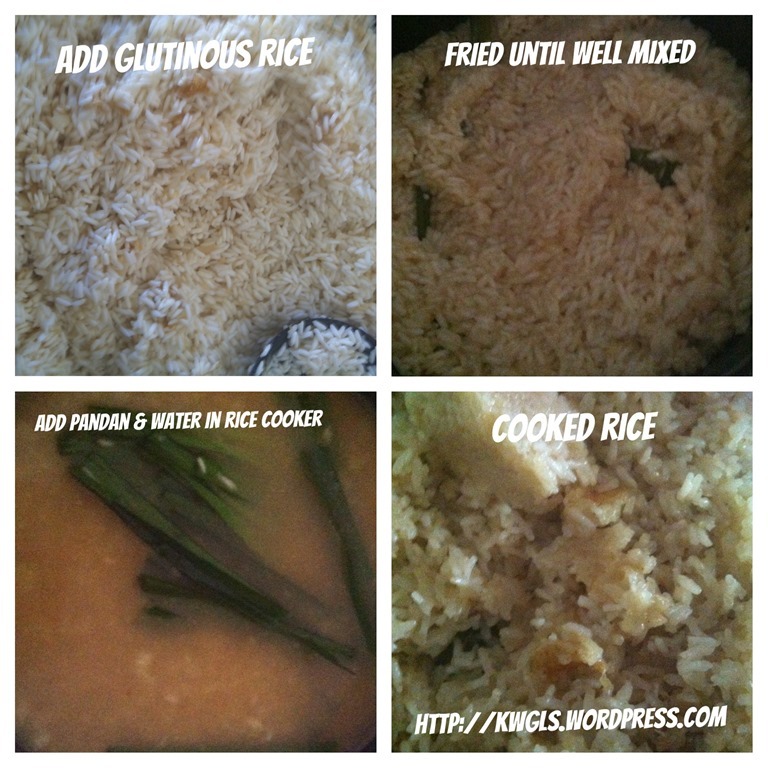 (Glutinous rice is sticky and when you fried it, your seasonings may be stick just one part of the rice. Therefore, this step is required to ensure all seasonings are evenly spread to the rice). After about an hour, the rice is cooked. Transfer to a big container, set aside and let it cool before the wrapping starts. If you are unsure about the water needed, add less water first, Then add more water when you find that it is not cooked or start to get burnt. It is ok to have a bit of rice uncooked because you will continue to cook them when you steam the Chang later on. Try to take a small spoon and scope some to taste. If you find that it is not tasty enough, add more seasonings at this stage to salvage your rice. But use liquid seasonings rather than solid seasonings. E.g. use light soya sauce instead of using salt at this stage. 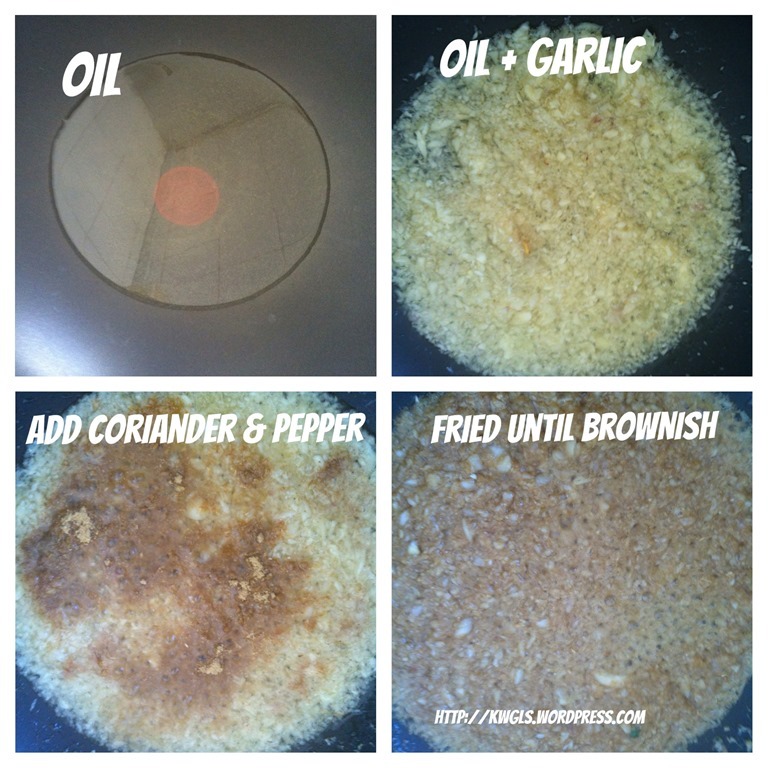 Add in the older half of the coriander powder, white pepper and five spice powder to the mixture and continue frying until the garlics and shallots start to turn brownish. Add in the chopped mushrooms and fried a few minutes over medium until you can smell the fragrance of the mushrooms. Add in the diced pork belly and fried until say 50% cooked. It is not necessary to be fully cooked because the frying will continues. Add in the minced meat and fried to say about 70% cooked. 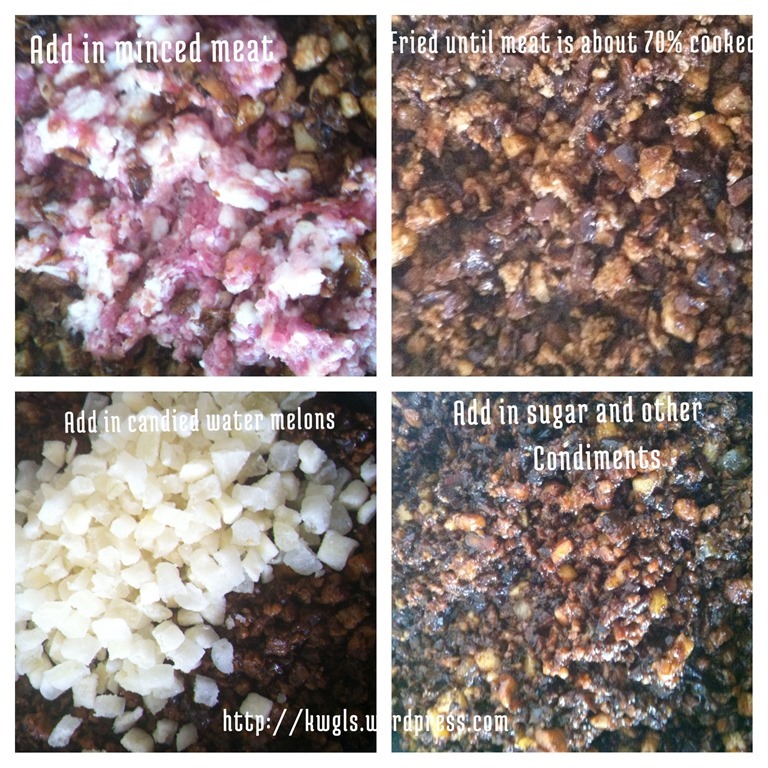 Note that the minced meat was not added together with the diced pork belly because minced meat is easier to cook. Add in the diced candied winter melons. Mixed well and add in sugar and other condiments. Remember that the fillings is quite a lot and you have to be heavy handed with your seasoning. Off the heat when all the fillings are well mixed and the colour is even. Not need to be extremely concern whether the fillings is well cooked. Any uncooked fillings will be cooked again during the steaming process. By now you should note your filling is quite oily. 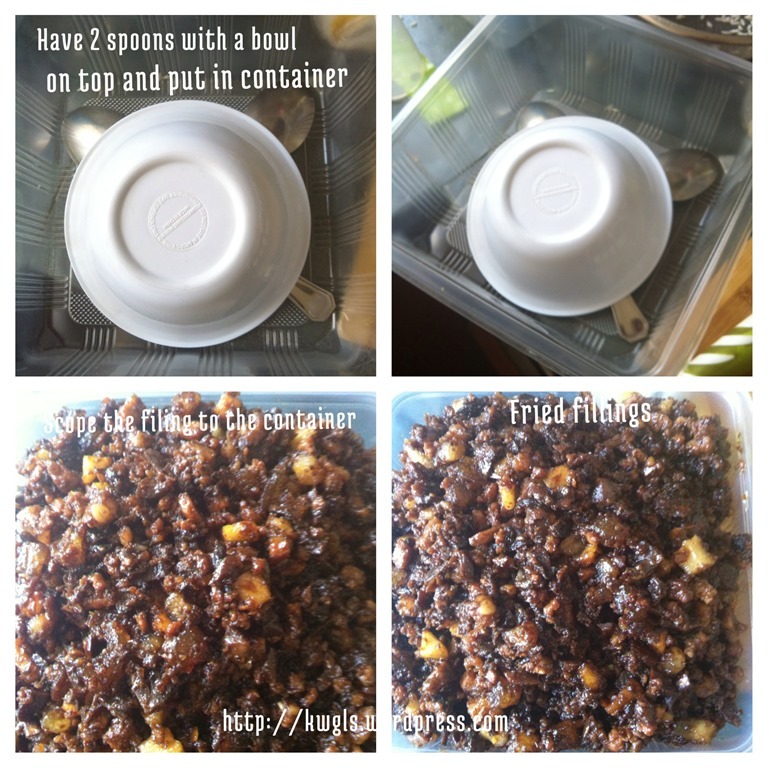 Get ready a container, place two spoons on the bottom and put another bowl upside down on top of the spoons. Transfer the fried fillings to the box and let it cool before you wrap the Chang. The main purpose of this step is to let the oil dripped down to the bottom so that your fillings on top will not be greasy. You can then throw the oil away. This is the traditional method that my mum used to do. However, you can try just to sieve it and let the oil dripped out. Before wrapping the Chang, let’s recap what you should have in the table. The following pictures was taken by my daughter as I only have two hands cannot capture the image. So it may not be that clear. 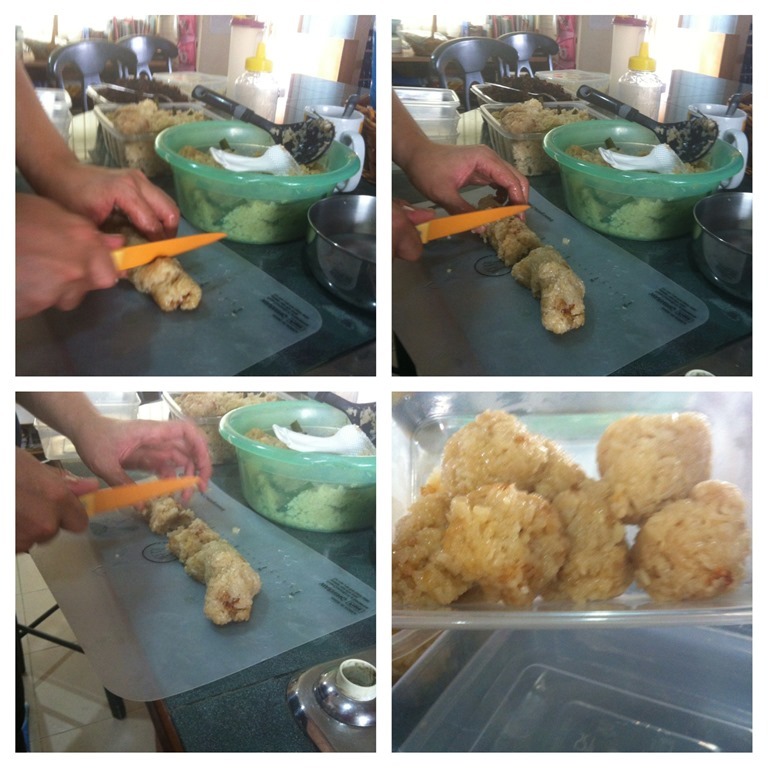 On a cutting board, roll the Chang into a long roll, divided it into about 60 g each and shaped it into a ball. Take two bamboo leaves and make it in a shape of a cone. Take one ball and try to make a hole in the middle. 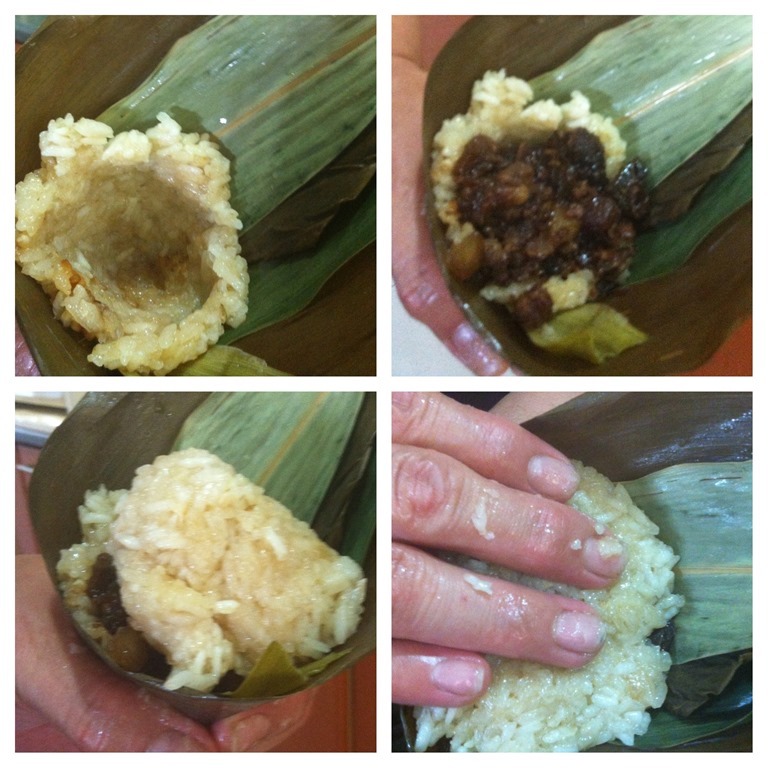 If you find that it is sticky, just dip your finger into some clean water and pat it on the glutinous rice. Put some water in your hand and press the rice downwards until you feel that there are no air between the rice and the fillings. Twist it side wards to follow the shapes of the Chang. By now, your Chang should be in triangular shape and you should be able to hold the Chang with one hand. Take a string and looped around the Chang tie using a live knot. If you find that Chang are not really in the shape you want, try to adjust it now. Loosen the string or adjust the bamboo leaves to shape it to the desired shape. After wrapping, check that there are no holes resulted from rough handling and there are small areas that are not covered with the leaves. These are “loopholes” that will create problems for you. If you boiled it , the rice will flow out (not all of course) and all the seasonings will be diluted with the water. It will also become sticky. JUST ENSURE THAT THERE ARE NO HOLES IN THE CHANG. If you are newbie, don’t be greedy. Wrap a smaller Chang first, smaller is easier to wrap. 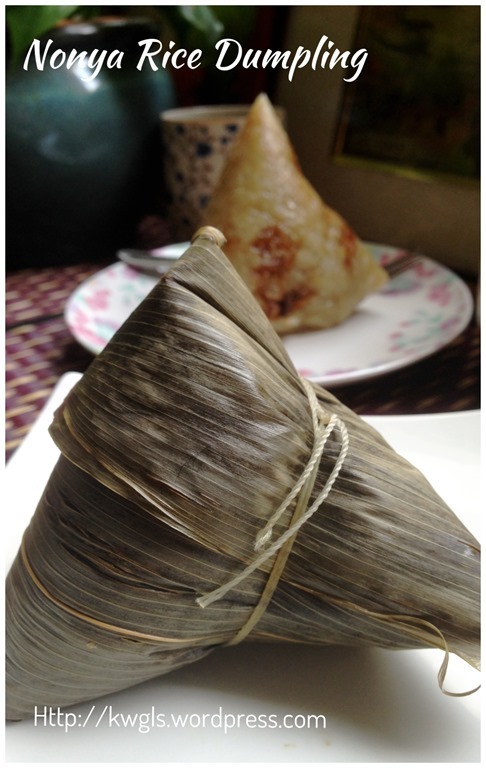 I hope that you can understand what I have described above and I have a YouTube video below to show you how to make the Chang at Zhong Zi- How to wrap Chinese sticky glutinous rice dumpling. Note that this video is sourced from YouTube and courtesy of Ms. Brenda Chiew. I press my Chang in the shape of a bowl and steamed it. 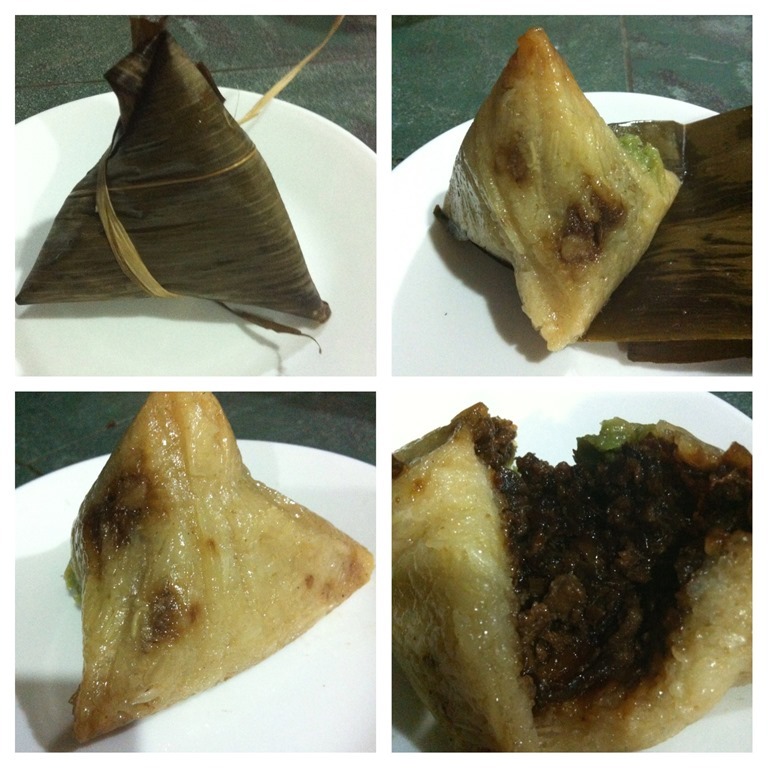 If you are not particular about the shape, you can still taste the Chang. 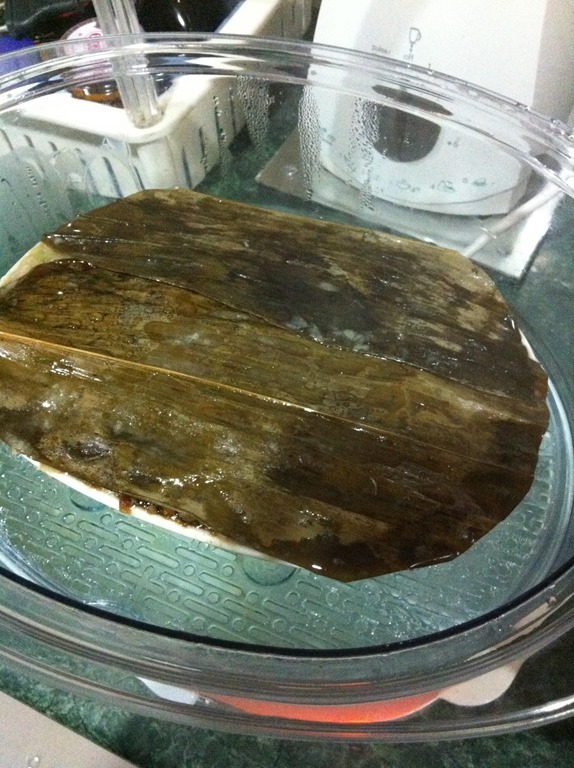 Steam the Chang for about 10-15 minutes to let the glutinous rice to take shape. Note that unlike the traditional method where you will need to boil the rice which shall take at least 2-3 hours. 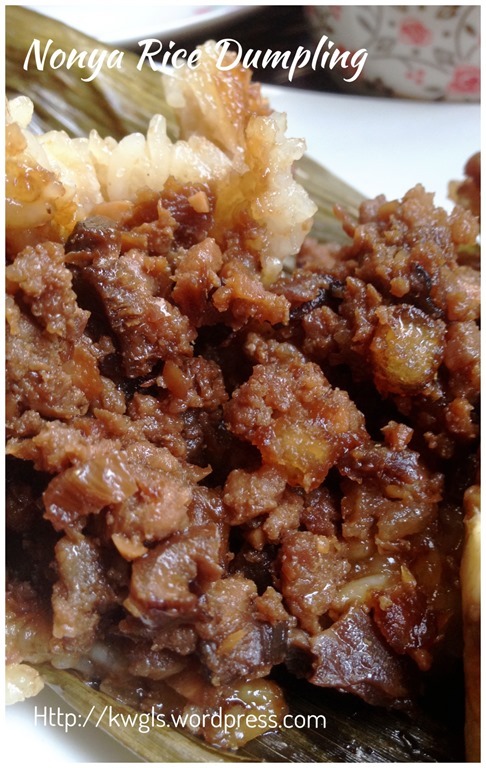 Your Chang will be ready and serve it when cool such that the glutinous rice will not be overly sticky. If you look at the Chang that I have prepared, you will note that the rice stick to each other meaning the rice is very soft. This will be better for those that have gastro intestinal problems. The light greenish colour at one of the corner is the green tea bean paste that I have added since I have some at home. There are a lot of Teo-Chew adding “Oni” or “芋泥” (a type of yam paste) to the Chang and the taste is awesome. This post has taken me 2 days to write and its getting longer. 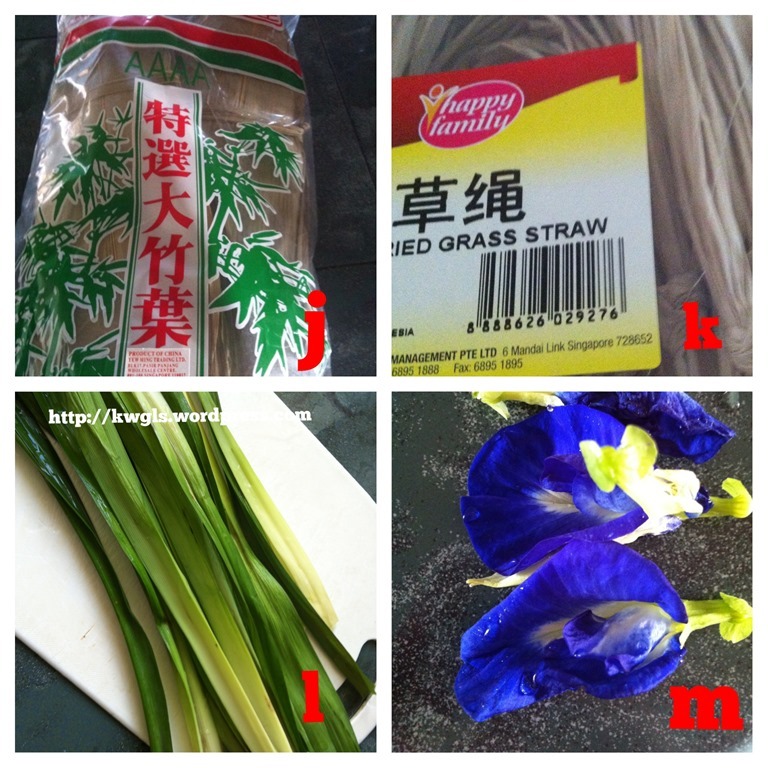 I may have a supplementary short post to highlight to you some tips on making the Chang. Once again, I have to stress again and again that my way of writing food preparation series is not really asking you to follow exactly my recipe. I would shared with you my steps in a simplified manners. I hope that readers can via my post, learn some thing, incorporate some of my steps for your convenience and create your own versions. 1. Considerably shortened the preparation time. The usage of box measurement will cut short your measuring time. 2. Using cooked rice instead of raw rice will increase your chances of success. 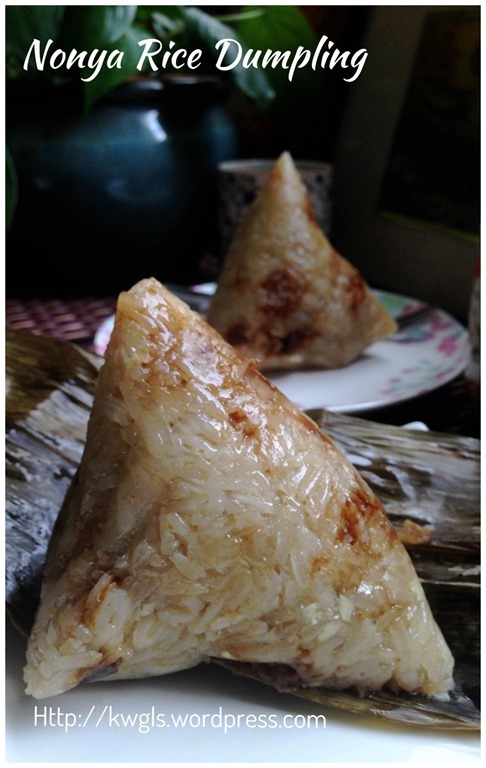 Cooked rice is easy to wrap into your desired shape and it will not leak out from the leaves. Tying the cooked rice Chang will be much easier than the raw rice Chang as it is softer. Usage of cotton strings will also help to ensure the Chang can be tied and no hole in it. Take your first step to make some Chang for your family today. Whatever the output will be, your family will appreciate your thoughts and giving all the supports you required. Cheers. Just wrapped 15 cups of rice, altogether about 45 dumpling. Pictures are new pictures taken. This entry was posted in Chinese and Asian Cakes and Snacks, Food Preparation Series and tagged 10, 8, bak chang, candied water melon, Food Preparation Series, GUAI SHU SHU, Guaishushu, kenneth goh, malaysia, nonya chang, pandan, Pandanus, postaday, rice dumpling, singapore, 娘惹棕，端午，粽子，. Bookmark the permalink. Possible for me to skip the Pandanus leaves? I don’t know where to get it.